A giant pumpkin has met its match - an African elephant. 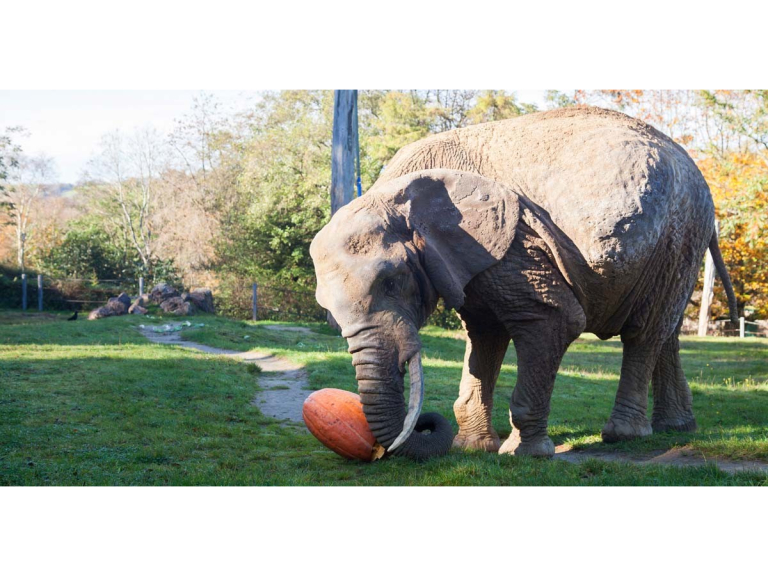 The pumpkin, weighing approximately 31 kilos and grown by Riverford Organic Farmers near Buckfastleigh, was donated to Duchess, Paignton Zoo’s matronly female elephant. The event provided half term fun for visitors and an edible plaything for Duchess. Environmental enrichment aims to encourage natural feeding and foraging behaviours, stimulate mental and physical activity and provoke curiosity using unusual objects and situations. It can range from puzzle feeders and wind chimes to unusual scents and cardboard boxes with food hidden inside. Paignton Zoo Environmental Park has won awards for its enrichment work and hosted regional and international conferences on the subject. Paignton Zoo is a registered charity. For more information go to www.paigntonzoo.org.uk or ring 01803 697500.